SWBAT collect like terms to simplify algebraic expressions by completing a 2 part task with partners. Students enter silently according to the Daily Entrance Routine. They find do nows on their desk with three questions. Question 1 is a complex fraction. I ask a student to put up the work for this problem. The students I choose for these questions must have decent hand writing and must be trusted to return to their seat with urgency to copy the rest of the work. I also try to choose different students than the ones chosen yesterday, as well as students at varying levels of performance. We evaluate the work together as a class after 4 minutes of independent work. For question 1, we review the process for simplifying complex fractions. Students are expected to rewrite complex fractions as division sentences. Questions one therefore becomes, 5/7 ÷ ¾ and then 5/7 × ¾ = 20/21. I ask for one student volunteer to share their work if they “did it a different way”. This is a strategic choice. During the initial 4 minutes of work time, I look to see if any students solved the problem using the alternate method discussed on Monday. This method requires students to multiply the numerator and denominator by the LCD of the fraction on the top and bottom of the fraction bar. In this example, multiplying the numerator and denominator by 28 would result in the same answer. The file named “alternate solution to #1” included in this section shows this solution. For question #2 I try to select a student that is higher in performance to put up the work. I also need a student with neat handwriting who shows all the steps for solving. While the work doesn’t have to be perfect, it does need to be close to it. This is a time intensive problem and I want to focus on the specific steps that are still confusing students, such as the squaring of the leading fraction in the sentence. For the final question I focus on making sure students understand that –b becomes –(–14) or +14. Various students are still having trouble with this tricky substitution. If needed, I have post its, or index cards, handy so that I can write “b” on one side and “–14” on the other to demonstrate a physical substitution of the variable. Students are asked to put away their thinking skills while I distribute 3 index cards to each student. Yesterday, students received a sheet of listing 11 vocabulary words to be used on this algebra unit. Today they are directed to use their 3 index cards to create vocabulary cards for the words base, exponent, and leading coefficient. I want kids to stop calling the base the “big number” and exponent “the little number” and use the proper 7th grade vocabulary. All students are told that they are responsible for this information for Friday’s quiz. 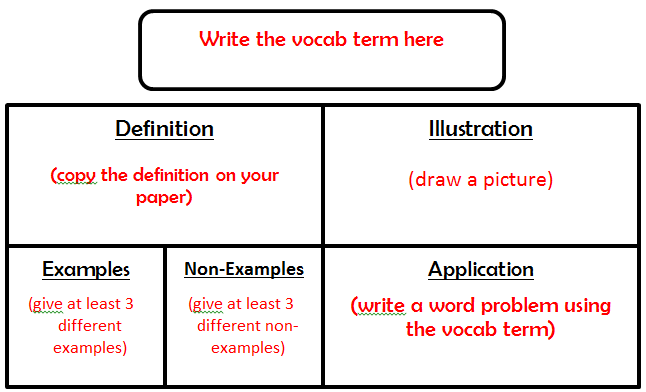 They have 6 minutes to make 3 vocabulary cards using the Frayer Model. Just like yesterday, some students may need the visual anchor below, thus it is displayed on the SMARTBoard during this section. I distribute Cornell Notes and highlighters while students are organizing their Do Now. I ask students to copy the AIM written on the white board. We will model and use highlighters as a note-taking tool and highlight important words and terms in our notes. I have one student read the definition of like terms, “terms that have the same variables raised to the same exponents”. I ask students what words or terms they should highlight (ideally “same variables” and “same exponents”). We also review the definition of a constant as a single number that stands alone, without a variable. Why is 9x – x = 8x and not 9x? Why can’t we combine 8x and 5 to make 13x? After answering questions, students are given the task. What are the like terms? What are like terms? You have a vocabulary list. Why are they like? Why are they not? What are the coefficients you are combining? What are coefficients? You have a vocabulary list. What are constants? You have a vocabulary list. Once there are 10 minutes left of class, students are asked to return to their desks. We review all of the answers to the first part as well as any two questions in part 2 that students would like to see worked out and with an answer.